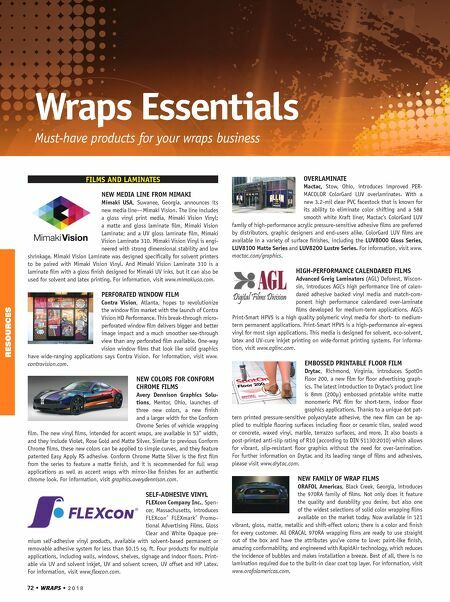 2 0 1 8 • WRAPS • 73 FIVE NEW TEXTURED OVERLAMS 3M Commercial Solutions, St. Paul, Minnesota, an- nounces five new cast vinyl décor overlaminates for its Décor Overlaminate 8600 Series, that add texture as well as a protective finish to any interior graphic. Each is embossed with a unique texture, offering designers and graphic manufacturers stylish matte finishes in Classic Linen, Knit, White Fir, Riverbed and Plaster. For information, visit 3M.com/WallWrap. 80/20 WINDOW PERF Continental Grafix, Statesville, North Carolina, introduces panoRama Film 80/20, an innovative non-adhesive, one-way vision product for P.O.P. displays, trade show displays, room dividers, cre- ative displays in museums, etc. The graphics can be applied directly onto the inside of windows using our panoRama Tape, our optically clear 2-sided tape, or used in hanging systems. For in- formation, visit www.cgxusa.com. BLACK WINDOW FILM XPEL, San Antonio, has added to its PRIME XR premium window film product line with a new black color option. The line offers cool looks, a cooler vehicle interior and exceptional clarity in a product that now complements more car and pickup truck exteriors. In ad- dition to XPEL's existing charcoal and blue color choices, the new black PRIME XR window film protects against the sun's harmful UV rays and infrared radiation with a heat-rejecting formulation that enhances driving comfort. For information, visit www.xpel.com. PRINTERS AND INKS VERSATILE ROLL-TO-ROLL PRINTER Mutoh America, Phoenix, Arizona, introduces the high-speed UV-LED VJ-1638UR 64" roll-to-roll printer, a versatile printer offering rich, bright colors, instant drying and odor-free printing, making this a smart choice for any busy print shop serving the commercial print and sign and display mar- kets. This affordable unit offers the same high quality and performance of Mu- toh's current UV-LED printers. For information, visit www.mutoh.com. ENTRY-LEVEL LATEX SOLUTIONS HP Inc., Palo Alto, California, presents the new HP Latex 115 printer, offering an economical entry point into sign and display printing services using proven high-quality, water-based HP Latex technology. The HP Latex 115 model is also available in the Print and Cut series, providing an end-to-end HP solution for printing and cutting. The six-color 54" HP Latex 115 delivers stunning results with high image quality across a wide range of applications for indoor and out- door signage. For information, visit hp.com/go/latex. ROLAND EXPANDS TRUE-VIS FAMILY Roland DGA, Irvine, California, announc- es the expansion of its TrueVIS family of wide-format eco-solvent inkjets with 30" and 54" SG series printer/cutters—de- livering vibrant color plus high-quality printing and contour cutting at an at- tractive price point. As part of the TrueVIS line, the SG series offers unmatched versatility, reliability and ease-of-use, along with a host of significant enhance- ments. For information, visit www.rolanddga.com. LATEX PRINT-AND-CUT SOLUTION GSG, Austin, Texas, now offers the HP 335 64-inch Latex Print and Cut Solu- tion. 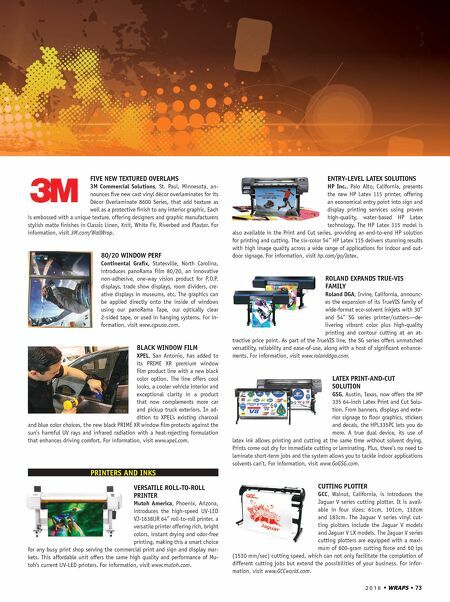 From banners, displays and exte- rior signage to floor graphics, stickers and decals, the HPL335PC lets you do more. A true dual device, its use of latex ink allows printing and cutting at the same time without solvent drying. Prints come out dry for immediate cutting or laminating. Plus, there's no need to laminate short-term jobs and the system allows you to tackle indoor applications solvents can't. For information, visit www.GoGSG.com. CUTTING PLOTTER GCC, Walnut, California, is introduces the Jaguar V series cutting plotter. It is avail- able in four sizes: 61cm, 101cm, 132cm and 183cm. The Jaguar V series vinyl cut- ting plotters include the Jaguar V models and Jaguar V LX models. The Jaguar V series cutting plotters are equipped with a maxi- mum of 600-gram cutting force and 60 ips (1530 mm/sec) cutting speed, which can not only facilitate the completion of different cutting jobs but extend the possibilities of your business. For infor- mation, visit www.GCCworld.com.